Visit the Face to Face: Portraiture in a digital age website. Dr Kathy Cleland (far right) and Eliza Roberts from Asialink (centre), at the opening of 'Face to Face: Portraiture in a digital age' by Prime Minister Julia Gillard (far left). Given our love affair with the human face it is not surprising that portraiture is one of the oldest and most popular genres in the visual arts, says curator and academic, Dr Kathy Cleland, who lectures in the Digital Cultures Program in the School of Letters, Art and Media in the Faculty of Arts and Social Sciences. And in a coup for Dr Cleland, the exhibition she curated called Face to Face: Portraiture in a digital age, was opened in Korea by the Prime Minister Julia Gillard during the PM's recent tour of Asia. The show, at the Seoul Museum of Art, opened on 25 April, and runs until the end of June. It showcases the work of 14 Australian digital artists including John Tonkin, also from the University of Sydney. Face to Face explores new forms of portraiture that incorporate a variety of technologies from 2-D digital prints to single-channel digital video and interactive installations, including Stelarc's famous Prosthetic Head, an animated 3-D computerised graphic of the artist's head that converses with audiences. 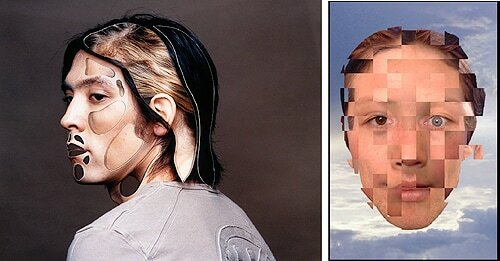 (L-R) 'Without You', by David Rosetzky (2003); 'In3Face', by Adam Nash and Mami Ymanaka (2002). "The show was picked up by Asialink after its tour by d/Lux/MediaArts in Australia," says Cleland. In Asia, the exhibition has previously toured to Bangkok, Singapore and Manila. "In Korea, they were really were interested in profiling Australia as being a technology-savvy and literate country, and challenging the idea that Australia is just about kangaroos and primary industries. "This is a great way to showcase Australian art and to show these artists who are at the cutting edge of technology." The exhibition is one of a number of events being presented by Asialink Arts in Korea during 2011 as part of the Korea-Australia Exchange Program to mark the 50th Anniversary of Diplomatic Relations. 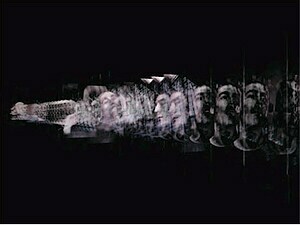 'Time and motion study', interactive installation by John Tonkin (2006). During Julia Gillard's tour of the exhibition she conversed with Stelarc's Prosthetic Head, asking it "What is happiness?" and jokingly agreed that she would "look into" Dr Cleland's suggestion that she should commission her own prosthetic head to help her out with media interviews. With the popular and traditional Archibald Prize currently running in Sydney, some might think that portraiture should be about using paint, but Cleland begs to differ, saying that over the past 150 years new imaging and media technologies such as photography, video and digital media have provided new ways of representing the human face as a visual image. "Like Narcissus looking at his own image in a pool of water," she says, "the portrait acts as a mirror held up to the human face. In today's media saturated environment the archetypal mirror image is only one of many technologically mediated images of the human face that are now available to us. These different media forms mirror the human face in different ways and, in very profound ways, affect how we see and understand ourselves." 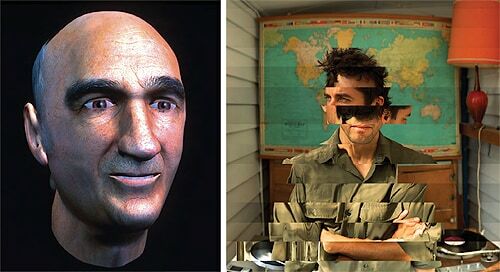 (L-R) 'Prosthetic Head', by Stelarc (2003); Portrait #2 (Chris), by Daniel Crooks (2007).